This Air King 18" rolling floor fan is built on an all steel frame which has rear wheels for easy mobility, which can also raise the fan from 46" to 48" above the floor. The 18" diameter, 3-blade fan creates 3190 CFM of air movement on its highest setting, while keeping relatively quiet at 67 dB. 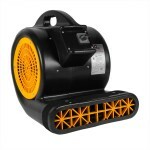 For more powerful fans that move more air, please take a look at our complete line of drum fans. Always place the Air King rolling floor fan on a stable, flat, level surface when operating to avoid the chance of the fan overturning. Simply tilt the stand backwards onto its wheels and transport as needed. The fan itself can be tilted in any direction to move air up, down, or in any other direction you may need air moved. The rolling stand allows you to get the fan off the ground to blow air above work benches and around other immovable objects. For other similar style fans, please check out our selection of pedestal fans. Stand keeps fan stable and elevated, making it able to blow air over work stations and benches. Pulls only 1.52 amps, so up to 9 fans could be run off the same 15 amp standard circuit. Rolling stand allows you to move the fan to the place where you need it most. Durable steel frame is located on a set of wheels to easily transport from place to place. Fan can rotate in any direction to move the air where you need it most. UL & ETL listed, plus the close mesh fan guard meets OSHA requirements. This is a review for the 18" Rolling Floor Fan - 3,190 CFM.